Shares of Longfin plunged for a second straight day after FTSE Russell said it would remove the stock of the small, cryptocurrency play from the benchmark Russell indexes. The tiny stock had skyrocketed in December after news it was acquiring a firm focused on the same blockchain technology as bitcoin. Longfin went public in mid-December and announced last week it was added to the small-cap Russell 2000 and 3000 indexes on March 16 as part of FTSE Russell’s quarterly additions. However, FTSE Russell said in a release after Monday’s market close that Longfin shares will be removed from the Russell indexes due to insufficient free-floating shares as of Feb. 14. The change is set to take effect after the close Wednesday and will include the Russell 2000 and Russell 3000 indexes. 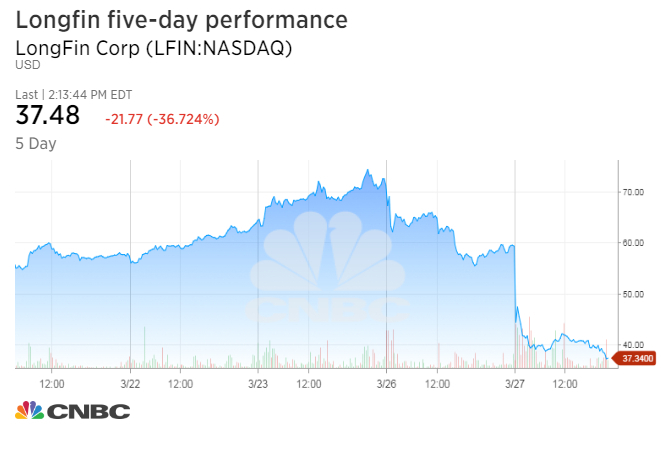 “We are reapplying” for inclusion in the indexes, Longfin CEO Venkat Meenavalli told CNBC in a phone interview Tuesday. He said the stock’s free float has increased above the minimum 5 percent as of March 11 due to the expiration of a lockup period on a consultant’s stock holdings. A 10-K is an annual filing required by the U.S. Securities and Exchange Commission that discloses details such as equity and financial performance. Previous: In Karachi, a Sino of things to come?